My husband’s great great grandmother Caroline Ralph (1850-1896) came to Australia at the age of four with her parents, Francis Ralph (1823-1915) and Caroline née Rodgers (1825-1893), and her brother, John Ralph (1848-1882). 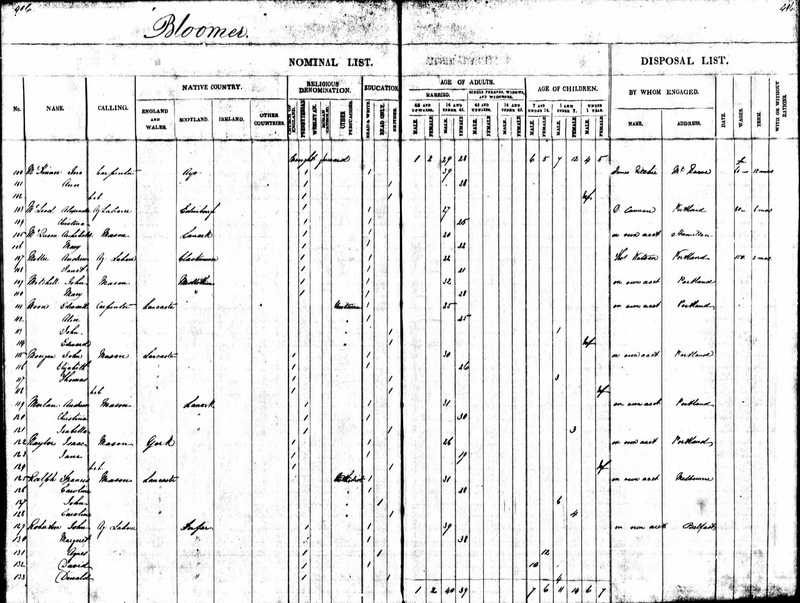 The Ralph family arrived in Portland, Victoria on 21 November 1854 on the Bloomer after a voyage of 124 days. They had left Liverpool on 20 July. This ship Captain Hunt from Liverpool July 20th arrived last Tues 21st inst. bringing 182 government immigrants, under the charge of Surgeon Superintendent Dr. Turner. There were 11 births on the passage and 3 deaths of infants. When the “Bloomer” left Cholera was at Birkenhead, the immigrants in consequence were embarked at Liverpool. The immigrants are almost all from the Southern Countries of Scotland, a large proportion of them are represented as being a superior class of mechanics. The Bloomer‘s voyage of 124 days was relatively slow. In the Tyranny of Distance, Geoffrey Blainey writes that although the First Fleet took 250 days to reach Australia in 1788, by 1816-20 the average passage was only 140 to 150 days and by 1849 had fallen to about 120 days. However, the coming of the American clippers in the 1850s meant the duration of the average passage continued to fall. In 1852, for example, the Marco Polo completed the voyage in 74 days. the Marco Polo, also of the Black Ball line left with 616 passengers and 400 tons of fine goods. The Marco Polo arrived 23 October after a journey of 93 days. The Bee arrived from Liverpool on 24 October after a voyage of 98 days. The Phoenix arrived on 30 October after a journey of 100 days. In 1852 the Marco Polo had completed the journey in 74 days; this 1854 voyage of the Marco Polo was slow apparently because of light and variable winds. The passenger list of the Bloomer records the Ralph family as coming from Lancaster, though in fact the Ralphs were from Cornwall. Francis was a mason; his religion was Methodist; and both he and his wife could read and write. Francis was 31 and his wife Caroline 28 years old. The children were 6 and 4. In the columns “by whom engaged” and “address” the Ralphs are recorded as “on own account” and “Melbourne”. In addition to John and Caroline born in England, the Ralphs had a further six children in Australia. 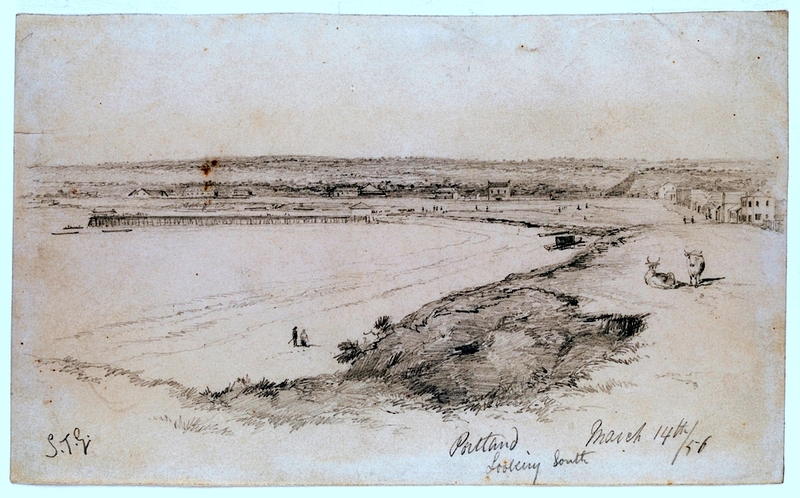 Elizabeth was born in Collingwood, Melbourne, in 1855. William was also born in Collingwood in 1857. The family moved to Ballarat and Eliza was born there in 1860 as were Christina (who died in 1870) and Francis; the youngest child, also called Christina, was born in Ballarat in 1871. Their daughter Caroline married Francis Gilbart Edwards in Ballarat in 1870. She died in Brighton, Victoria in 1896. Francis and Caroline moved with some of the family to South Australia. Their son John died there in 1882. The following children married in South Australia: Eliza in 1883, William in 1885, Elizabeth in 1886, Francis in 1888. Caroline died in South Australia in 1893 and Francis died in 1915. Russell, Roslyn and National Library of Australia (issuing body.) High seas & high teas : voyaging to Australia. Canberra, ACT NLA Publishing, 2016. This is a very new book on immigration – beautifully illustrated which gives a terrific sense of what it must have been like to travel to Australia. The book includes extracts from diaries of travellers and shipboard newspapers. Charlwood, D. E. (Donald Ernest) The long farewell (New ed). Penguin, Ringwood, Vic, 1993. Another book on the experiences of the voyage to Australia. Blainey, Geoffrey The tyranny of distance : how distance shaped Australia’s history. Sun Books, Macmillan, 1968. Trace, Keith. “Shipping.” EMelbourne the City past and Present. School of Historical & Philosophical Studies, The University of Melbourne, July 2008. Web. 1 Apr. 2016. <http://www.emelbourne.net.au/biogs/EM01366b.htm>.